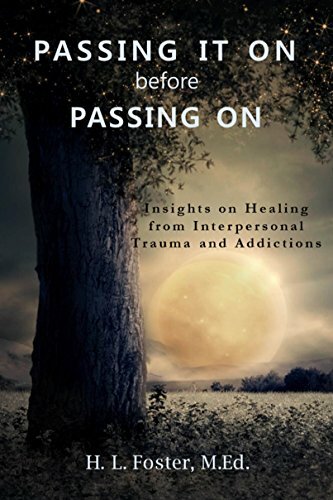 HomeBook Review: Passing it on Before Passing On by H. L. Foster, M.Ed. When I first read Passing it on Before Passing On, I paused and thought about my life and how it was moulded by my thoughts and reactions. Our thoughts are powerful motivators and can lead us down different paths, some unproductive and some destructive. We cannot control much of what happens around us; all we can control are our reactions to these things. This is a taste of the wisdom Foster imparts in her book. Our thoughts and reactions are powerful weapons that can be used for us or against us. Foster was born in 1944 in the coal mining town of Minto, New Brunswick, Canada. She was an only child born to middle-aged parents. She married, had two children, battled cancer and suffered abuse, an eating disorder, depression and a broken marriage. Lost in the battle to survive, she used alcohol to keep her ship afloat. Then she lost both her parents in a single car accident. A once-connected child, Foster found herself a disconnected adult, searching for the source of the void within. Decades later, she discovered the reasons why and slowly began reconnecting with her inner self. These sorts of experiences are often a two-step forward and one-step back ordeal; it was no different for Foster. She’d no sooner get a grasp on one problem only to have another surface. Foster’s ability to tell her story of discovery and healing and share it with readers is matched with her ability to understand how the mind works to enable healing. It gets readers thinking about themselves and what they can do to improve their circumstances in life. Readers suffering with an addiction will find insight in to how to start the healing process. Those unencumbered by such addictions will find anecdotes that may enrich their lives through deeper thought and re-evaluating their thoughts and reactions. The book can be read from start to finish, or it can be opened to any page to find a bit of wisdom. I thoroughly enjoyed this book. I’ll read it again next year to remind me of the lessons in life I learned. This book is available in paperback and eBook form at Amazon.ca and Amazon.com. Never had addictions myself, but had an alcoholic much older brother (probably had PTSD from the Korean War) who died before 50 from that, smoking and overweight. My other older brother never smoked or drank. So I took a middle road. Wish now I’d gotten closer to the one passed on to learn more of what happened. You are not alone. I wish I had learned more from my father before he passed. I was 21 and had not a care in the world. After he died, I learned more about his experiences overseas during the Second World War, and that is what I contribute much of his drinking to. He was a sniper on the front lines. He had a soft heart and loved kids (good thing; he had 11), and seeing the kids suffer in Italy really affected him. I’m told he had a good friend die in the trench beside him. Drinking eased his mind I guess.